Become a Bible-A-Month Partner and make an eternal difference. 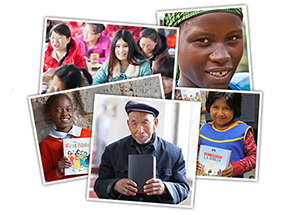 American Bible Society Partners have helped provide God's Word to more than 42,000,000 people in 400 languages. Please join them! Every $5 you give helps provide a Bible to someone waiting to hear the Good News!